The Anand-Carlsen World Championship Match is now history, with Magnus wresting the title with the score, 6½-3½. 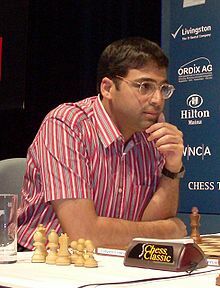 A premonition of the disaster for Vishy was seen in their encounter in Tal Memorial Tournament, Moscow 2013. “Today’s game against Anand was probably our last encounter prior to the World Championship match in November in Chennai, and it attracted quite some attention from the photographers at the start of the round. Letting him off the hook in a very promising position in our game in Norway Chess last month, I was of course disappointed and I’ve been looking forward to our game today. As white I had a small advantage out of the opening due to the open c-file and his restricted bishop on b7. When he retreated the bishop to c8, the position was already uncomfortable for black. Click here for pgn download. A polished performance by Magnus. Sadly, Vishy played as if he was doomed. 1. The images here are from the official site of Russian Chess Federation. Special Thanks to Mr.Vladimir Barsky and Ms Eteri Kublashvili who captured these wonderful pictures. This article is on a previous encounter, not the Match itself. About the Match: Apart from Carlsen’s three wins there are 7 draws. Three of them are relatively short. Even they have nuances that are seen only after a careful examination. Here is one of them. All the other games were bitter battles. When two players fight on the edge of precipice how does one say, courage is wanting? As for errors, forced or otherwise only a deep investigation can tell what went wrong. This world championship had tough technical positions and one needs to learn from them. A “match” that shouldn’t deserve any attention by anyone anymore. “Creativity takes courage,” famously said Henri Matisse. Did you see any of it in Chennai? Nooo, no way! “One man with courage is a majority,” said Thomas Jefferson. Did you see one in Chennai? Nooo, none!